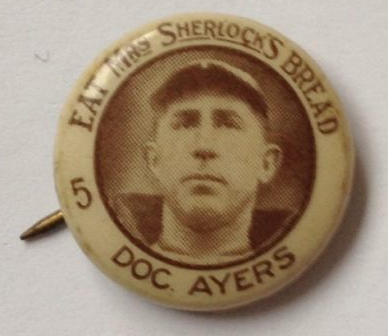 In honor of Leap Day 2012, let's check out a set that's almost as rare as a double blue moon, Mrs. Sherlock's Bread Pins, and learn some interesting things about its pictured player, Doc Ayers. Back in the 1920s, before widespread radio broadcasts pushed fan bases beyond a day's travel, the "local team" was a group of guys in your town, be it major, minor, or little league. That meant Mrs. Sherlock's Bread of Toledo, Ohio followed the Mud Hens of Toledo, Ohio, a franchise successful (and long-lived) enough to still be widely known today. Mrs. Sherlock's Bread contracted with their parent company (Bastian Brothers of Rochester, NY) to produce button-style sets in 1920, 1922, and 1933 as store-distributed promos, few of which survived to reach the modern collecting market. Pins rusted, cracked, and bent over time, making them an easy target for trash day. 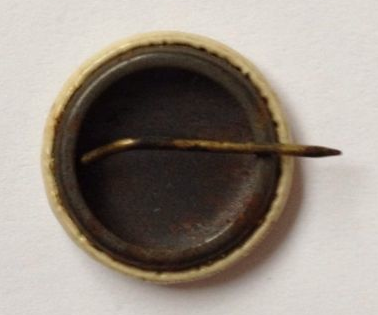 Almost all surviving buttons lack the "Bastian Brothers, Co." label originally inserted behind the pin itself. 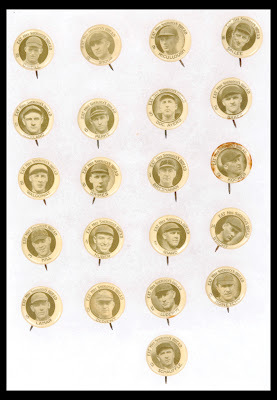 1922 is the only numbered set and its 21 tiny pins include HOF manager Roger Bresnahan (picture nicked from a now-defunct Legendary Auctions listing, circa 2012). Doc Ayers pitched for 9 years in the AL prior to joining Toledo on the backside of his pro career (stats at Baseball Reference) and figures in some interesting baseball history. The "good-pitching loser" concept led me to an article called The Best Losing Pitchers of All-Time by The On-Deck Circle. Doc Ayers didn't make its minimum inning cutoff, but compares favorably to some of the guys talked about. In today's era of 30 teams and better trainers, I can imagine someone with his inning-eating ability hanging around for quite a while. Value: This mid-grade #5 sold for $60 on eBay in Feb 2012, very close to the NM guide price. You can expect pins in decent shape to sell for higher amounts, thanks to their rarity. Love to see the old stuff. You're my Antiques Roadshow for the evening. Thanks. Type 5 pins came in 7/8 inch size. I have one in a size closer to 1/2 inch.Are these rarer? Not sure, does your Type 5 set otherwise have the same look and layout? For Mrs. Sherlock sets, I've just seen 7/8" size.